Plagiarism is the act of using another's work without crediting the original source. This can be considered as an act of fraud. Unintentional plagiarism is an easy trap to fall into and no one likes to be accused of cheating. Many institutions have an acceptable similarity score when checking original work for plagiarism. Can words and ideas really be stolen? Yes. Copyright laws protect intellectual property which is basically the first recorded and documented instance of that form of expression. Simply failing to add quotation marks or properly citing your sources will be considered as stealing those ideas. You should also be wary of how many quotes and citations you use. Even used properly, if the majority of your work is made up of quotes and citations it can also be considered plagiarised. It's surprisingly easy in this day and age to unintentionally copy or produce very similar work to something that already exists on the world wide web. We provide the very latest in search technology to give you confidence in the originality of your work. Our Clonewolf rating is based on the total amount of any cloned text found with details of any sources so you can examine where things may have gone wrong. All academic institutions have a clear policy and strategy for how they test for plagiarism. We recommend you familiarise yourself with this to address any concerns or questions you may have about unintentional copying. 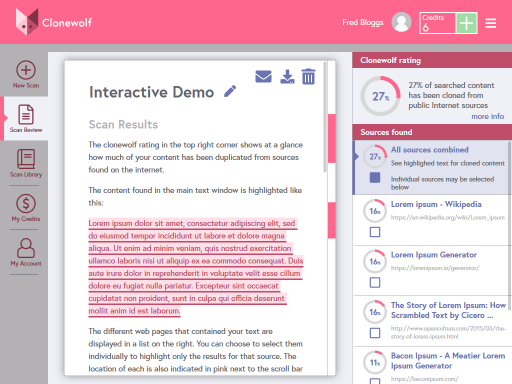 Clonewolf provides a branded pdf report that could potentially be submitted to your education provider as proof of originality at the time and date of a scan. Achieve peace of mind by using Clonewolf to check your text against any publicly available source.